Ebony has a message of success for your audience, as well as an fun and entertaining style that will inspire your audience to tap into their potential. Ebony delivers motivational talks on what it takes to achieve success, tap into our potential and become World Class. Her talk covers principles such as Drive (the inner core and foundation for peak performers); Success Mindset (how the world class think); Self Management (how peak performers control emotions and to motivate themself) , Environment (creating the high performance environment for success) and Mastery (how the world class develop skill and expertise). 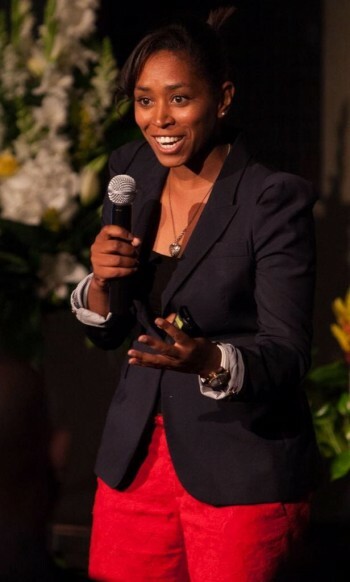 Ebony has developed her talks from experience over the last 20 years in high performance environments and as a trained performance coach and Master Practitioner of NLP. Ebony aims not only to inspire audience but highlight tools and techniques that help individuals and teams tap into their potential and achieve greater success. Ebony integrates personal stories from handling setbacks and career threatening injures to performing at the peak of success. Ebony will provide the tools for your audience necessary to meet challenges and increase personal and team performance. Participants will leave excited about the potential with Ebony’s message, and will be motivated to take action.